Black Circles is a website which lets you order tyres online to have them fitted at a local garage. They have a huge choice of tyres at a great price, so 9 times out of 10 it is cheaper to order from them and then just pay for fitting and balancing at a local garage/tyre fitters. They also offer a fitting service where you select a local tyre dealer to fit the tyres at a time convenient to you, pay the full price online and then the tyres are delivered directly to the tyre fitters and you just turn up. 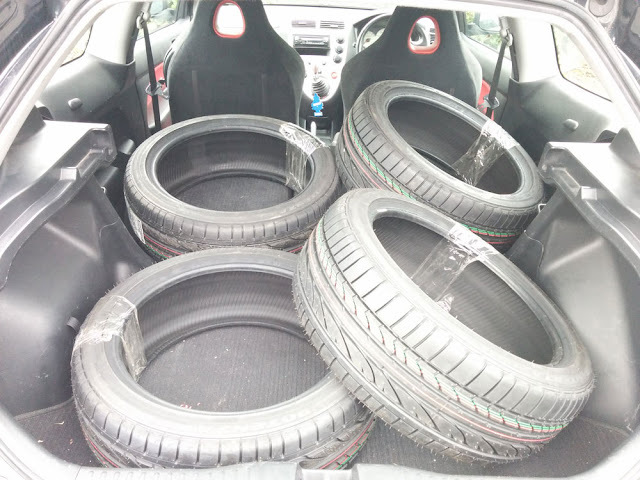 I was considering changing the tyres of my Honda Civic EP3 Type R back to the OEM size of 205/45/17 as the previous owner had opted for the cheaper 215/40/17 size. With the current state of the UK roads I wanted a bit more comfort and also felt the extra compliance would improve grip. A couple of weeks ago, my car failed it's MOT because of the two rear tyre inside edges being worn (camber bolts and FRSU). I decided it was time to take the plunge and buy a set of four tyres in the OEM size. You cannot underestimate the difference a good set of tyres will make to to how a car handles, and like many petrolheads, I am extremely picky about which tyres I was going to fit. Especially if I was buying a whole set of four. So I headed over to BlackCircles to see what was available in that size...the answer was a lot so I spent a while reading tyre reviews on the cleverly named TyreReviews.co.uk to find the best tyre possible for my budget. Currently TopCashback will give you 2.1% cashback just for visiting Black Circles via one of their referral links. Not a huge saving but better than nothing. The Bridgestone Potenza RE050A looked fantastic so I ordered four of them at 1.30pm on Thursday, a confirmation email quickly came through with an estimated delivery day of the following Tuesday. Amazingly, three of the tyres were delivered on Friday. My MOT was running out the next week so I was worried the order had gone wrong, I got on the phone to BlackCircles and spoke to (a real person!) in customer services who was very helpful and after checking up on my order, explained that they were expecting the final tyre to arrive on that day and a few hours later it did. I guess because they ship them as four separate parcels they are sometimes delivered on different days. Not normally a problem but in my case it caused a small concern. All in all, my review of Black Circles is a positive one as they provided a great service at a fantastic price (the best I could find online). This is the 2nd time I have ordered from Black Circles and I would not hesitate to do so again.